Use of this website or information, products and services available on this website is at the user’s own risk. Notwithstanding the provisions of section 43(5) and 43(6) of the Electronic Communications and Transaction Act, Findtakeaways.co.za accepts no liability whatsoever relating to any loss, expense, claim or damage, whether direct, indirect or consequential, arising from the information on this Website, your use of this Website or any actions or transactions resulting therefrom, even if Findtakeaways.co.za has been advised of the possibility of such loss, expense, claim or damages. Findtakeaways.co.za makes no presentation or warranty, whether express or implied, as to the operation, integrity, availability or functionality of this Website or as to the accuracy, completeness or reliability of any information obtained from this Website. Findtakeaways.co.za also makes no warranty or representation, whether express or implied, that the products, information or files available on this Website are free of viruses, destructive materials or any other data or code which is able to corrupt, compromise or jeopardise the operation or content of a computer system, computer network or your hardware or software. You accept all risk associated with the existence of such viruses, destructive materials or any other data or code which is able to corrupt, compromise or jeopardise the operation or content of a computer system, computer network or your hardware or software. Findtakeaways.co.za accepts no responsibility for any errors or omissions on this Website. Findtakeaways.co.za may, in its sole discretion, at any time, suspend or terminate the operation of this website or any of the products or services provided in terms of this Website, without prior notice. Notwithstanding the fact that this Website may refer to and/or provide links to other websites, your use of such other websites is entirely at your own risk and Findtakeaways.co.za is not responsible for any loss, expense, claim or damage, whether direct, indirect or consequential, arising from your use of such other Website. Findtakeaways.co.za also does not endorse, warrant or make any representations about the content, products, services, security or reliability of such other websites. All advertising material is subject to approval by Findtakeaways.co.za, who reserves the right to reject or cancel any advertisement deemed to be unsuitable for any reason. This may include ads which by our determination promote competing products or services or negatively affect our business or relationship with our users. Advertising space is subject to limited availability and will be handed out on a first-come first-served basis. Once all of the available advertising slots are filled, further advertisements are queued (stored off-line) until the next available slot becomes available. Findtakeaways.co.za staff will notify queued advertisers of the estimated time that their advertisement will make it on-line as well as the date it actually goes on-line. Rates (fees) are subject to change with prior notice. Only new or renewed contracts are affected when rates change. Page views are defined as anytime an advertisement is displayed to a visitor of our web site. Findtakeaways.co.za is not bound to comply with advertiser instructions if they conflict with established policies. 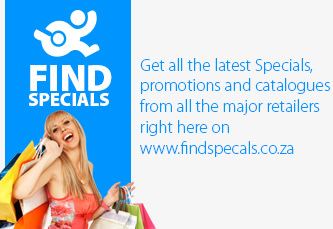 All advertisements are positioned according to rules dictated by Findtakeaways.co.za. The advertiser and any associated company(ies)/agency(ies) acknowledge that they own the rights and permissions to publish submitted material on the Internet. Each agrees jointly and severally to indemnify and save harmless Findtakeaways.co.za against all damage, loss, expense and liability of any nature arising from our use of the advertisers submitted graphic content on the Internet. Findtakeaways.co.za assumes no liability for errors in materials. All attempts will be made to correct any errors that may appear. Findtakeaways.co.za reserves the right to refuse or postpone the display of submitted advertising content until all monies have been received (including the clearing of bank checks) in full and advertising space becomes available. Findtakeaways.co.za is not liable for delays in publishing or failure to publish submitted advertising content in the event of circumstances beyond the control of Findtakeaways.co.za. You will not post content or advertising material that infringes or violates someone else's rights or otherwise violates the law. Ads cannot include any content that infringes upon the rights of any third party, including copyright, trademark, privacy, publicity or other personal or proprietary right. Ads cannot contain, facilitate or promote 'spam' or other advertising or marketing content that violates applicable laws, regulations or industry standards. You will not use our copyrights or trademarks, logos or any confusingly similar marks, without our written permission. Findtakeaways.co.za.co.za cannot be held responsible for any mistakes, inaccuracies or other errors on this website including any pamphlets/leaflets of any retailer. Findtakeaways.co.za is a subdivision of Brandwell Branding Solutions. You will not issue any press release or make public statements about your relationship with Findtakeaways.co.za without written permission. - You warrant that you have the legal authority to bind the advertiser to this agreement. -You agree that if the advertiser you represent violates this agreement, we may hold you responsible for that violation. When you purchase advertising on Findtakeaways.co.za, you agree to pay all amounts specified in the order on the date of placement of the advertisement and or every monthly placement thereafter. Payment will be due payable on the first day of every month. We may provide notices to you by sending them to an email address or street address that you previously provided to us. Notices shall be considered received by you within 24 hours of the time posted or sent; notices by mail shall be considered received within three business days of the time sent. Findtakeaways.co.za cannot be held liable for any harm or loss resulting from malicious software code or viruses in this message or attachments, including data corruption resulting there from. If this message obtains offensive, derogatory or defamatory statements or materials, it means the message has been sent outside the senders scope of employment with Findtakeaways.co.za and only the sender can be held liable in his/her personal capacity.